Around this time of year, I get a statement from my bank, detailing my purchases on my debit/credit cards over the course of the year. I always find it interesting to look back and see where my money goes, and this year the longest list is by far for groceries. My first initial reaction was, “wow I spent a ton of money on food!” But as I kept looking over this statement, I realized that the bulk of my money really does go into other things…various household bills/insurance, etc. Most of you know this song and dance. The more I thought about it and started breaking it down in my head, I realized that it was only around 10% of my income that actually went to food. I am even accounting for purchases that were made outside of this particular account…in my case, this includes the grass-fed beef that we buy in bulk. Ten percent, in the grand scheme of things, seems so small. Especially where our health and nourishment is concerned. One of the things I hear most when I get on my “healthy eating” soapbox…eating like this (ie: eating organic and buying wild raised meat) is expensive. Yes, it is more expensive when you put it right next to the cost for the conventional produce and meats. But there are some things we can learn here. You are not spending the extra money on the cheap snacks or junk food. These things add up! If you just drink water, you are not buying soda or juice, so that saves money right there. In 1901, about 40% of a household income went to food. In the 1950s, a mere generation ago, it was about 34%. Fast-foward to a more familiar 2002-2003, and it was 13%. The last report I could find was from 2010 where food had dropped down to 9.8%. During this time, what has happened to our health? Lets look at just one chronic condition; type 2 diabetes. These rates have gone up so much that the name had to be changed from Adult-onset Diabetes to Type 2 diabetes. Why? Because too many kids were being diagnosed! What really concerns me is I know too many people who have worked and worked, saving for retirement, only to retire and have their entire lives savings wiped out when they have a heart attack/stroke/cancer. Usually far to early in life. Fun fact: aging happens inevitably, as the cells in our body are copied and reproduced over and over again. Like a copy of a copy of a copy, the quality of these copies simply decreases over time. The rate of these copies is determined by the stress and demands that our lifestyle puts upon our bodies over the years. If our cells are allowed to make copies at a their normal, homeostatic pace, we should get like 110 years out of our bodies before the copies simply become unreadable and we meet a peaceful end to what should theoretically be nice long life on this earth! So lets talk about my eating habits and where my 10% went. Do I eat organic and wild meats? Yes, I really do, most of the time, on most things. My priorities towards food quality go to the things I eat a lot of. If I eat eggs 5 days a week, I am going to make sure they are good, free-range eggs from chickens that spend time pecking around outside and in these winter months, are not being stuffed with GMO soy and corn. This is important to me. If I am out at a restaurant, do I go hungry if the salad is not organic and the burger is not grass-fed? Of course not! It is the things we eat/do the most that matter the most. That 10% really seems nominal when I think about the monthly cost of the now-mandatory health insurance bill. I really find it quite disconcerting that my family pays the same in healthcare costs and the family who is on 5 prescriptions or insulin injections. Apart from well-baby checks, no one in my family has been to the doctor in almost two years. Notice that I have now used the terms “chronic” and “acute.” This is where we need to differentiate between the use of hospitals/doctors and the use of say chiropractors/exercise/healthy lifestyle choices. If you fall and break an arm, I hope you are not going to try and treat it with a grass-fed steak and salad. If you have a heart attack, I do hope you get to an ER and a cardiologist, not a gynecologist. However, after the heart attack, are you going to take nutrition/lifestyle advice from that same heart doctor? I hope not. 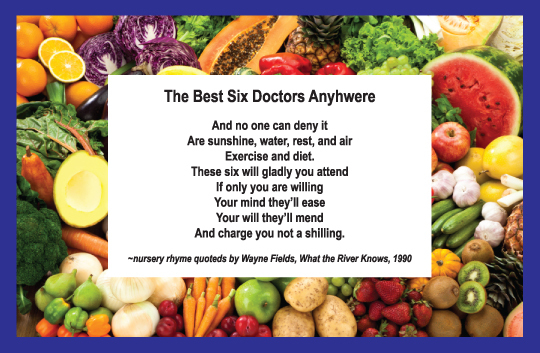 This doctor will have had little to no education in food and nutrition for the body. It would be like calling the fire department back to rebuild your house after they put out the fire. They simply do not have the right tools. Healing from chronic conditions really is like healing your house after say mold/fire/flood. You have to do some rebuilding on your house and that can start with the food you put into it. Food and the nutrients it provides, are what replenishes all of the cells in your body. Your skin is your body’s biggest organ and it replaces the outer layer (the epidermis, the part we see) every 35 days. Every 6 weeks you get a new liver, and every 2 months you get a new brain! Every 5-7 years you actually pretty much get an entire new body. We are amazing creatures! If you give your body what it needs to do all of this, you really can heal yourself from the inside out. The ideal situation would be to just keep the proverbial house clean as the years pass. Basic maintenance if you will. When it comes to the only place you truly have to live, it is in your amazing, wonderfully complicated body. Don ‘t you think you deserve to give yourself and your family the best chance possible?